I'm back from the conference Anthropology and Cosmopolitanism at Keele University (1h from Manchester, UK). As I've learned from entries on Savage Minds, job hunting and networking are a main point of anthropology conferences arranged by the AAA (American Anthropological Association). Luckily, this wasn't the case with the conference I've attended last week: The main purpose seemed to be socialising - without ulterior motives: The participants were very friendly and open people. It seemed to be that I've talked at least to the half of all participants. The topic - cosmopolitanism - seemed to have attracted a certain kind of people. "There are nearly no Americans here", one delegate wondered. Usually, lots of Americans attended conferences arranged by the Association of Social Anthropologists of the UK and Commonwealth. What I found most striking: The largest part of all delegates were migrants! Nearly none of them is working at a University in the country they were born. I met an anthropologist from Sri Lanka who's working in the USA, another anthropologist working in Canada, originally from Turkey but - as she said - "a product from Norway". There were quite a lot of German anthropology migrants living in the UK, and from Switzerland and Italy. A woman wore a badge with "Aberdeen University" on it. Of course, she told me that she's from Malta! Many participants appreciated the social events. In contrast to other conferences, nobody left the venue after the day's final lecture. 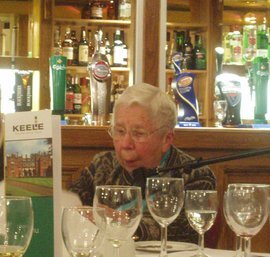 There was nowhere to go as the University of Keele is a kind of academic ghetto, located far away from the nearest village. And the lectures actually lasted until 11 o'clock at night! 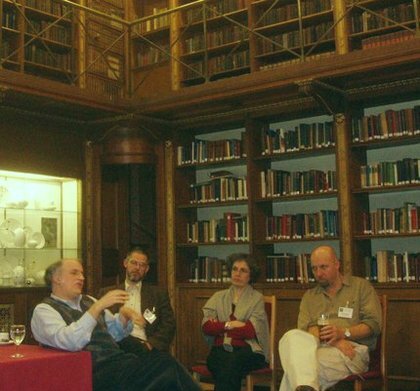 I especially enjoyed these less formal after-dinner lectures - held by Elizabeth Colson (see picture to the right), by Andre Beteille and a debate on Robert Hayden’s ‘Shared Shrines, Syncretism and Tolerance’ in the old library (see image below), published in Current Anthropology. But concerning the topic of the conference, I wonder if I might have learned more if I had stayed at home and read the papers on my own. There were many very weak presentations: Most paper-givers read their papers monotonously and went over time. There was never enough time for discussion. Furthermore, generally three or four papers were read one after another without any breaks in between! It reminded me of the worst seminars during my first year at university. Several participants left these panels before they ended. After a short walk in the sun, I met a young PhD-student. He was as frustrated as me: "It's my first and probably my last conference", he told me. I wondered: Is the main purpose of a conference to deliver a paper in order to get it listed on one's CV as John McCreery supposes while we discussed the topic How To Present A Paper? "If you want to be considered a serious academic you have to read your paper. That's standard and just the way it is", one of the elder anthropologists informed me. Some papers haven't even had much to do with the topic of the conference (a few paper-givers admitted it openly!). On the last day of the conference, Keith Hart said (maybe too harshly? ): "Anthropologists don't care for cosmopolitanism. It's just an excuse to come together. We're not engaging in the world. We don't talk about Iraq and Iran. Our detached discourse lacks wider relevance." As I've found out afterwards, Keith Hart had said something that many delegates agreed with. The organisers had asked great questions about cosmopolitanism, but we haven't heard many concrete answers. I missed debates about moral and ethical issues: Recently, several magazines and newspapers have discussed cosmopolitanism as an answer to the growing polarisation between socalled Western values and the socalled Islamic world. After the controversy around the Mohammed-cartoons, mainstream-media loved talking about culture and religion wars and Huntingtons clash of civilisation. But maybe we should have talked more about cosmopolitanism? Is this correct? Is cosmopolitanism a better alternative than multiculturalism? If yes, how could anthropologists contribute to a more peaceful, just, cosmopolitan world? Nobody addressed these questions. Rather, extreme relativism prevailed. French anthropologist Benoît de L'Estoile for example, argued, we shouldn't define the term cosmopolitanism by its moral qualities (openness to the world, empathy etc). It is in his view problematic to define some people as good (cosmopolitans) or bad (non-cosmopolitans). 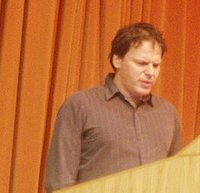 Nevertheless, there were many interesting papers (among others by David Graeber, see image to the left). I'll have a look at them during the following days and weeks, (I hope) and will try to summarize some of the discussions. See also my earlier post For an Anthropology of Cosmopolitanism. Great post about the conference. I was there as well and in conversation with many of the other academics there, we came to the same conclusions. As regards the reading of papers… It really was, on occasion, literally that, as presenters failed to turn up, and other people read out their papers in their places! Come on, we are all perfectly capable of reading, but a conference should be about dialogue, shouldn’t it? I mean, I always thought of conference papers as a work in progress? I presented in a panel, and felt that the questions people asked were really helpful. I did not read my paper, but presented the main points. But the other side of the conference was great. Eating and drinking in good company, and the opportunity to socialize and network, particularly over dancing at the gala dinner! Cool, you’ve been there too! Yes, I agree, the social part of the conference was great! I don’t regret the journey! Concerning the presentations: Maybe there is a need for an anthropology of anthropology in order to review (and renew) our practices and rituals on conferences and other occasions. Most people seem to take part in ritual practices they are critical of. David Graebers paper is more than 50 pages long… But yes, I’ll write about it! I’m really glad people enjoyed socialising at the conference - that was one of its main aims. Personally I thought the plenary addresses were of a very high standard and the forthcoming ASA volume based on them should prove this. There were also some very good papers presented at the parallel workshops, and summing up of the conference by David Parkin and four other workshop leaders were all superb. We were sad that Jonathan Friedman and Ken Brown were hospitalised and couldn’t make it. Reading their papers was obviously not a substitute for the real thing. Hart arrived two days late and missed our discussion of world affairs and the relevance of cosmopolitan and anthropology to wider world and events the renewed question of empire in our time. No-one mentioned the brilliant Hohodza Zimbabwean band. Thanks for the comment. Yes, you’re right Pnina. The were many very good papers (but the presentations were bad) and we all enjoyed the band (and watching dancing anthropologists). I’ll post more on my blog but here’s my knee-jerk reaction to the “If you want to be considered a serious academic” comment. Isn’t anybody else tired of being told what a “serious academic” is supposed to be like as a human being? I don’t usually like to spew opinionated rant but this is one of the issues that may easily get me. I might be way off but, to me, a serious academic is someone who does serious work within academia. Personality matters, in many respects. So does presentation style, especially when you go for an interview or when you happen to care about teaching. But what link is there between “academic seriousness” and conference strategy? Ok, ok… I’m getting off the sandbox, for now.